Once you have contacted Cheshire’s & South Manchester’s leading flooring installers we’ll arrange with you for a flooring estimator to visit your home to measure the area. Although we can give a guide price based on your own measurements over the phone, the firm price estimate will be based on a survey of the site and the measurements taken by our estimator. Our flooring estimator will carefully measure the area and provide you with an in-home estimate for the most cost-effective fit. 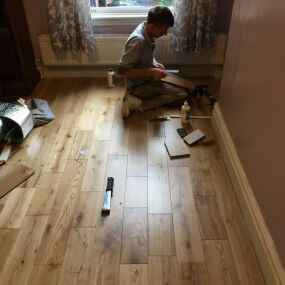 We’ll discuss your estimate with you, including your flooring selection, appropriate underlay and accessories, and any preparatory work which may be necessary. You can accept the estimate during your appointment, or via email or post, and we’ll then discuss expected timescales and payment before ordering your flooring. Subject to stock availability, we aim to fit flooring within 14 days of you accepting our estimate. When your new flooring arrives at our warehouse, we’ll contact you to arrange your fitting date. It’s worth bearing in mind that some flooring products need to be delivered to your home ahead of your fitting date, so that they can acclimatise to the location. We’ll let you know if this is the case. 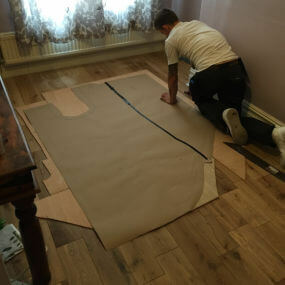 Depending on which additional services you’ve arranged with us, you may have to make some preparations before our fitters arrives to fit your flooring. If you’re not using our dedicated removal services, please move any furniture and remove any old flooring to leaving a clear room ready for the fitting. If you’ve booked us to move furniture for you, please clear any objects such as ornaments, and draw or cupboard contents. What to expect on fitting day? You or your representative will need to be at home, so that our fitters can discuss your requirements and raise any unforeseen issues that may need to be addressed. 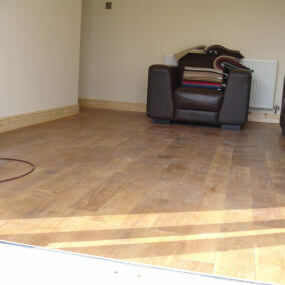 Our fitters will prepare your sub-floor as necessary and lay your new floor so that it’s just right. When they’ve finished, they’ll remove any waste including your old flooring if you’ve booked the disposal service. They’ll leave the room looking tidy, so you can start enjoying your beautiful new floor. Our complete service will of course do all the measuring for you, but before you choose your flooring, it’s a good idea to make a rough measurement of your space. This will help you see how much flooring you’ll need, and give you an idea of how much it will cost. Take measurements across the longest and widest points of your room, ensuring that you measure into any alcoves and doorways. You should add 10cm onto each measurement to allow for cutting and trimming. Bear in mind that your eventual cost will be more than just the price of the flooring; it will also include fitting charges and any additional materials or services that you buy, such as underlay or disposal of old flooring. Most of our carpets come in either 4m or 5m widths, therefore the variable measurement is the length. In the example shown the room measures 3.6m by 4.5m, so the minimum you’ll require is 3.7m by 5m (allowing for the 10cm cutting and trimming). The most economical way to order carpet for this size room is to have 4m width carpet and have a length cut to 4.6m.